LOS ANGELES — On Thursdays, we wear pink. 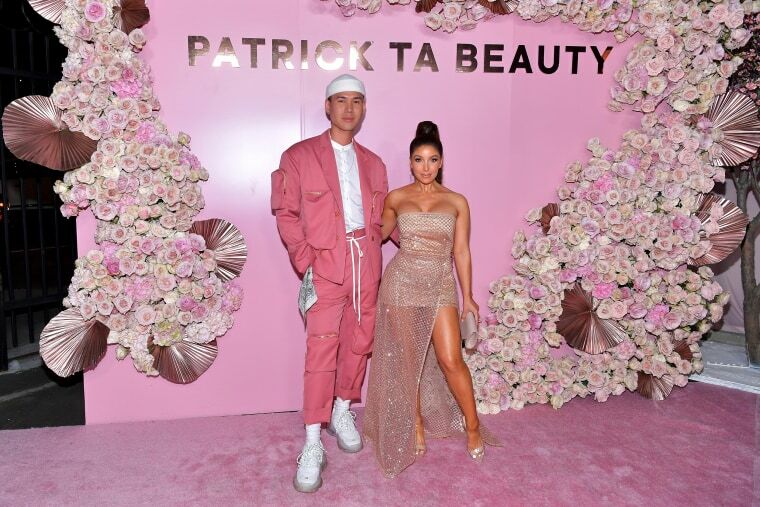 Olivia Munn, Shay Mitchell, Rosie Huntington-Whiteley and more gathered in rosy-hued ensembles to celebrate the launch of makeup artist Patrick Ta's new beauty line, Major Glow, on Thursday night. They blended right into the party, which transformed Hollywood's Goya Studios into a cotton-candy wonderland, complete with Moet & Chandon rose champagne, giant pink balloons, rose bouquets and cherry blossom trees. Munn was happy to show up for her longtime makeup artist. "Patrick is really amazing because he doesn't do the same makeup on every single person," the "Predator" actress told Variety. "You're Asian, you're brunette, you're blonde — and there are makeup artists that I have worked with that will do the same makeup on each of us. We would all have the same contour; we'd all have the same highlight in between our eyes, the same color, the same way that they shape our eyes. And with Patrick, everybody would get something that was custom to their face for what he sees and for what he thinks is going to make you feel your best." One of Munn's favorite memories working with Ta occurred at a low point in her style career. After botching some paparazzi photos while sporting a Ta look, she said the pair laughed so hard, he had to retouch her tear-stained face. "There are a lot of makeup artists and hair stylists that can make you feel insecure if you don't knock it out of the park, or they're comparing you to their other clients," Munn said. "In that moment, we just bonded so fast, and it just made me feel that no matter what, if I nail it or not, he's going to be there rooting for me or laughing with me. Immediately, from that moment on, I felt comfortable with him. He's going to be family for life." Huntington-Whiteley admitted she almost missed the rose-gold memo — her pale pink jumper was a last-minute purchase. But her dewey makeup -- courtesy of none other than Ta, himself — gave her some added carpet confidence. "Patrick does the best glowy, luminous skin," Huntington-Whiteley said. "And this evening, he did my makeup for the event, which I feel very privileged that he made time for me on this special evening." Ta closed out the night with a heartfelt thank you to all the attendees, which also included model Alessandra Ambrosio and beauty influencer PatrickStarrr. "I always knew I was gay, but I wasn't out, and women made me feel confident and beautiful in my own skin," Ta said in a speech to the blushing crowd. "When developing this beauty brand, I really wanted to create products to empower women to feel confident and to feel beautiful and comfortable in their own skin in the same way that they made me feel."